Leah Turner claims she worked hundreds -- maybe even thousands -- of hours at Chipotle without getting paid. Her manager would tell her to "clock out" but continue working until all of her tasks were done, Turner says. So she would keep going, knowing that the extra hour -- or two or even three -- was free labor. "I don't know why we didn't fight back," Turner told CNNMoney. "I wanted to advance in the company, so I kind of just did it. We all did." After years of this, Turner pushed back. She was one of the first to sue Chipotle (CMG) for unpaid labor in 2013. Her case -- Turner v. Chipotle -- is now a class action lawsuit. Nearly 10,000 current and former workers have joined her lawsuit. They allege the company cheated them out of wages, a violation of America's Fair Labor Standards Act. "I've worked in a lot of restaurants. I've never experienced anything like that," says Turner, who has also done stints at Burger King, Taco Bell (YUM) and Denny's (DENN). Chipotle denies any wrongdoing and says the case has "no merit." The chain's slogan is "food with integrity." It promotes a wholesome image with responsibly-raised meat and GMO-free food. Entry-level workers also get paid about $1 more, on average, at Chipotle than fast food chains like McDonald's (MCD), according to Glassdoor, a salary tracking website. "We do a number of things for our employees that are uncommon in our industry," says Chipotle spokesman Craig Arnold. Benefits -- even for hourly workers -- include paid vacations, paid sick time and tuition reimbursement. But dozens of workers from all over the United States have reached out to CNNMoney to share their stores of "the real Chipotle." They want the company to pay them what they're owed and to stop making employees work off the clock. They vow to fight for as long as the legal process takes. Here are the stories of Turner and two others who are among the 10,000 workers suing Chipotle for wage theft. When Turner joined Chipotle as a kitchen manager in March 2010, she was in her early 30s and "gung ho" about moving up the management ranks. 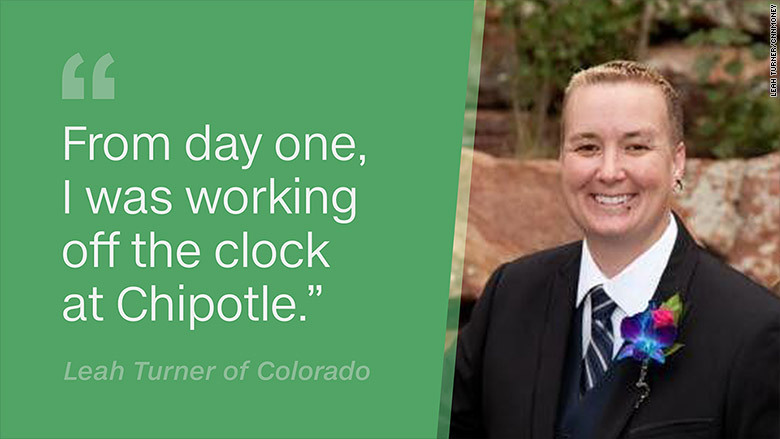 She oversaw seven to 10 people in the grill area at a Chipotle located in Parker, Colorado. "From day one, I was working off the clock at Chipotle," Turner claims. She quickly realized there was an intense focus on keeping labor costs below a certain level. Her boss -- the store manager -- was obsessed with printing out hourly reports of how sales were doing versus labor costs, Turner recalls. The manager would walk right up to people and tell them, "Hey, clock out," but the expectation was people would keep working because the store was often understaffed. Even worse, Turner says the manager would sometimes go back into the computer system and trim people's hours retroactively if labor costs were above her goal for the day. "She would change our times, so we wouldn't get paid for the full time that we were there," claims Turner, who would have to turn around and force people under her to work off the clock too. "I was threatened that if I didn't keep my [labor] numbers down, I wasn't going to have that position," says Turner, who kept her head quiet for awhile and got promoted to store manager. She eventually moved to a new store. She says working without pay was happening there too, and she realized it wasn't just the result of one flawed boss or store. "It's hard to see Chipotle as successful as they are...treat their employees the way they do," says Turner, who left the company in 2015. Her one regret is not fighting back sooner. Araceli Gutierrez's dream was to become a chef. She was in her early 20s when she got her break in 2010 at the Chipotle in Orange County, California. She landed on the "prep crew." There was intense pressure at her Chipotle location to snag an award as a top performing location, she says. Everyone at her store worked hard to achieve that goal. Keeping the restaurant sparkling clean was a priority, so they would stay as late as 3 am or even 4 am cleaning. The problem is, they would be clocked out at midnight. Gutierrez was so into her job that she even came in on her days off for "cleaning parties." She thought she was getting paid for the extra hours. But soon she found out that she was not. 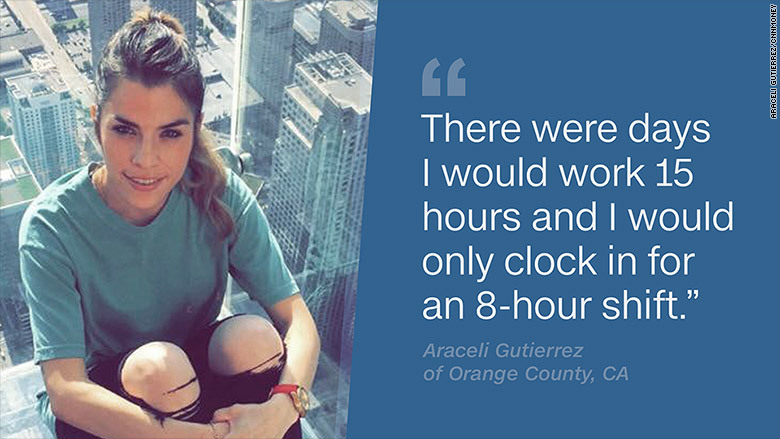 "There were days I would work 15 hours, and I would only clock in for an eight-hour shift," Gutierrez told CNNMoney. Gutierrez worked at Chipotle for four years, moving up the ranks to become a kitchen manager, service manager and then assistant manager of the store. About 90% of managers come from within the ranks of crew members, a company spokesman said. She recalls getting phone calls all the time from managers above her telling her, "Labor costs are high right now. Send some people home or tell them to clock out." When she tried to speak up, Gutierrez says the response was, "It's part of the job," and "You can't sue." "I honestly just want Chipotle to follow the law," says Gutierrez, who read about Turner's lawsuit online and has since became one of the other lead plaintiffs in the case. Brett Charles thought he landed a dream job when he started at Chipotle in the summer of 2011. Not only did he love the food, but he relished the cool vibe at the restaurant he worked at in Gilbert, Arizona. Plus, it was a short bike ride from his college classes. He started at the cash register. He said that was easy. But when he moved to join the prep and grilling crew, life changed. "When your shift ends at 3 or 4pm, you had to have certain things done (before the shift ends). If you don't, they expected you to clock out and keep going," Charles told CNNMoney. He says the expectations were "insane" for how much you could get done. Almost every day, he claims he would stay and work an extra half an hour to an hour off the clock. Sometimes it would turn into three extra hours unpaid if it was a really busy day. His managers "dangled" the possibility that he could be promoted to kitchen manager. But that never happened. A new store manager joined, and expectations were ratcheted up even more. "Fridays are absolutely crazy. You would have to prep way more than on a Tuesday, but you're still given the same time limit to do it," claims Charles. 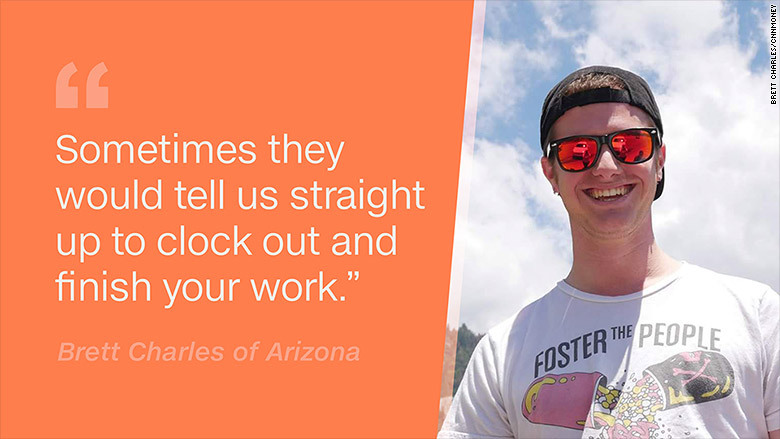 "Sometimes they would tell us straight up to clock out and finish your work." 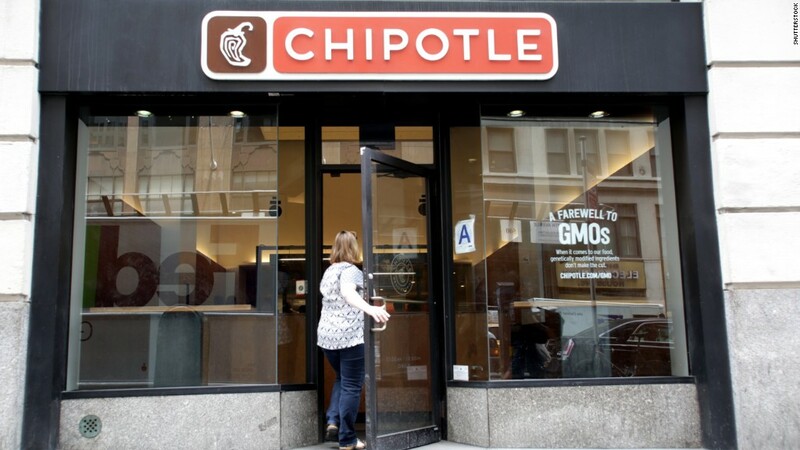 Charles left Chipotle in 2013 after finishing his college education. He now works in IT. He heard about the lawsuit from a friend a year or two ago and called lawyer Kent Williams of Williams Law Firm to see how he could join. He is now one of the seven lead plaintiffs in the case. "It felt kind of awful to know how many other stores are having this same problem," he said.